Last week, activists from the organisation Greenpeace hit the Victoria & Albert Museum (V&A) in a protest over car manufacturer Volkswagen’s sponsorship of their new exhibition, ‘The Future Starts Here’, which opened last weekend. “From smart appliances to satellites,” the V&A website reads, “artificial intelligence to internet culture, this exhibition brings together more than 100 objects as a landscape of possibilities for the near future”. The protesters however put on their very own exhibition. In the courtyard of the museum, four women dismantled a VW Golf car with the slogan: “The Future Doesn’t Start Here.” It was aimed at revealing the pollution-producing components of the car beneath its sleek surface. Greenpeace are currently running a campaign which calls on Volkswagen to abandon diesel cars and instead invest in electric. The stunt serves to be its own kind of art within the grounds of a museum which is home to some of the most incredible paintings, textiles, and other arts London has to offer. This “fringe exhibition”, as Greenpeace termed it, raises questions over the relationship between museum funding and the environment, and more than that the association of the art-works themselves and environmental activism. Much loved cultural institutions such as the V&A rely on generous funding and sponsorship in order to bring their exhibits to the public. Yet where this support is coming from is a concern of many environmental activists. In fact, communities of artists are in the process of leading mass campaigns against the sponsorship of art instructions by unethical companies which pose a serious threat to our environment. This is thought of as ‘art-washing’. In this way the company strives to present themselves as benefactors of the arts in order to clean up their public image and garner support for their businesses. Organisations such as Art Not Oil and Liberate Tate see this as staining the arts. They have led their own campaigns against the sponsorship of London’s museums and cultural institutes, as well as further afield, targeting BP and Shell, with a variety of stunts. Their aim is silencing support for oil companies in order to make them no longer seem respectable partners for museums and cultural institutions. They want to disgrace these companies to the degree that tobacco companies are no longer deemed appropriate sponsors. It is interesting to interrogate what responsibility these museums have to lead the way on these issues. In the current climate, it is incredibly challenging for many art institutions to secure enough funding as it is. Are these museums duty-bound to act ethically, or should they be thankful for support wherever that arises from? This forces forward questions about the art-world more generally – does art have an obligation to take a moral stance on these issues? Many artists would agree. Today art often plays a crucial role in protesting environmental concerns such as pollution and climate change. Clearly, nature has long been a source of inspiration for artists. However, this form of art attempts to change the world for the better rather than just representing it aesthetically. This could come in the form of stunning photography of the environmentally damaged areas, sculptures depicting the melting of glaciers due to global warming, or paintings representing a kind of dystopian future of our world unless we clean up our act. Jeff Hong’s viral images of twisted Disney characters share this intention of alerting the public to the realities of pollution such as his picture with Little Mermaid covered in oil. Others attempt to protest ideas about conservation by creating beautiful pieces using the environment, such as sculptures out of waste and recycled materials. John Sawbaw’s work is a prime example of this. He supports eco-consciousness by helping to save waterways from coal mine pollution by turning that pollution into valuable pigments and paints for his art. 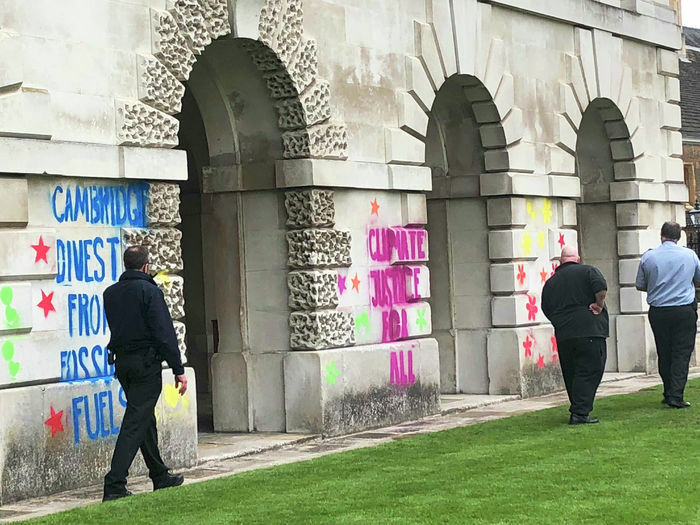 Whether it is viewed as ugly and damaging or vibrant and challenging, there is clearly a complex debate over what the purpose of art is in such highly politicised environmental activism.